Several years ago on an extended kayaking trip, one of my tent-mates forgot to pack his camp spork. Quick to be creative, he sharpened the end of his toothbrush into a food skewer, and the end result was something of serrated beauty and detail. We all told him to patent that nonsense at the time, but in reality, he ended up eating with his hands a lot that week. The spork is a camping essential on your gear list, so don’t make light of it when it comes time to shop. While it may be small and easily forgettable, the idea of getting your hands covered in rehydrated beef stroganoff every night can be a major emotional breaking point in the backcountry. Don’t get covered in beef stroganoff. We’ve done the dirty work for you and put six of the most popular sporks to the test in a head-to-head competition. We tested their durability, functionality and versatility as a kitchen utensil, and I’m here to tell you exactly which is the best spork for you, based on your individual camping needs. Buckle up — this is the Ultimate Spork Showdown. We devised tests to help us determine each spork’s performance in these three key areas. We don’t all eat the same thing when we go on the trail, nor do we want to. Some of us like the packability of grains like couscous. The beauty of the MRE is that you can eat it straight out of the bag without the mess. And I’m not willing to sacrifice my carby spaghetti goodness for the sake of convenience. You shouldn’t be limited by your spork on what types of food you can buy and eat on the trail. We tested four of the most popularly consumed trail foods to make sure that the spork truly performed, because nobody wants to play “here comes the airplane” by themselves at the campsite. Researcher’s Note: Human garbage disposals were standing by to make sure little to no food waste was created. Boil test: What happens when we boil the sporks? I once bought a cute and lightweight camp spatula for a week-long trip on the Colorado Trail. I was so proud of my little kitchenette set-up, until Night 1 when I attempted to make quesadillas. I left the spatula on the stove and it promptly melted into a goop in the pan. Don’t buy a spork that melts into a goop in your pan, and certainly don’t waste quesadillas in the backcountry. That story inspired this durability test. We dumped all the sporks in a pot together and boiled them on a stove on high heat for 4 minutes. After boiling them, we drained the water and let the sporks stay on high heat at the bottom of the pot. (We repeated the experiment inside so we could guarantee our pot got extra, extra hot). Pressure test: What happens when we intentionally try to break the tines and the handle before boiling? After? To that, I say nay! We didn’t just want to rough up the sporks (we were already doing that by towing them between different testing sites in our own packs), we wanted to literally break the sporks if possible. We put all our natural force into snapping the handle or the prongs like a twig. We performed this both before our boil test and after, because if these sporks are breakable, we wanted you to know exactly how and where. How efficiently does the spork serve as a stirring device? A scooping device? A serving device? We let the soup get as hot as possible and got to stirring, testing each spork throughout the entire cooking process and observing if steam ever became too hot to bear. The fear was that a spork with too short of a handle could put you at risk of getting burned, and that’s really no good in the backcountry. Following the stirring process, we used each spork to scoop and serve both chicken noodle soup and couscous. (Why didn’t we attempt to scoop the spaghetti? Because I’m a monster and I use my hands). Each spork was used with the intent to scoop 5 of the happiest, hardiest helpings into the camp bowl and camp mug. We compared which sporks were able to scoop most efficiently and the most in quantity. Then, for good measure, we used each spork to scrape out the remaining contents of the pot. An efficient scraping spork will reduce waste and improve the kitchen cleanup process. The Snow Peak Titanium Spork is my go-to for any and every food consumption related activity. It’s lightweight, arguably indestructible but still bendable, and comes in a variety of colors. Hallelujah, Titanium! It will scoop, stab and stir as effectively as you’d hope any multi-functional kitchen tool could. Your hands only get a little bit sticky when eating out of an MRE, but you will have no problems scooping up the last bits of ooey, gooey goodness before licking it clean. Pick the Snow Peak Titanium Spork if you want a spork that will do it all and get it done for a long, long time. The Light My Fire Polycarbonate material is a rad upgrade from fast food cutlery, and the price is evident of that. You can buy and break five Light My Fire Plastic Sporks before you’ve spent as much money as the price of one Light My Fire Titanium Spork. It worked the best as a scooper/server because I wasn’t worried about scratching up the bottom of the pot, yet its flexibility means the Light My Fire Plastic Spork can’t carry heavy things very well. Not to mention, I think the mildly awkward spoon-on-one-side and fork-on-the-other design is kinda cheating as a spork. It was the only spork that we successfully damaged in some way through our experiments, and reviews elsewhere suggest that this is moderately commonplace. The heat from the pan left small warps in the material and a tine eventually broke after our second Pressure Test (womp womp). Researcher’s Note: If your tent-mate is a notorious spoon biter, gift them the Light My Fire Plastic Spork for minimal mid-meal noise pollution. Out of all the sporks we tested, the Sea to Summit AlphaLight Long will always hold a special place in my heart. It’s lighter than the Snow Peak by .2 oz but sacrifices durability a small amount. Because of its long handle, it acts as the perfect stirring spoon and makes eating out of a plastic bag seem like something humans should always do. It’s not made out of titanium, but unless you’re trying really hard to break it, I think the StS Long will have your back. Not to mention, the StS Long scooped the most impressively hefty ball of spaghetti and boasted a dandy spoon to fork shape ratio. The adorable carabiner that comes with it may prevent me from forgetting it on future endeavors. Adding this spork to the research list left me with more questions than answers. It fascinates me because it is so wildly different and rogue. The CRKT Eat’n Tool is heavy, short, awkward, comes with a bottle opener and is probably indestructible. Why does it come in four colors? Why does my spork need hex wrenches? Why is it more than 3x as heavy as the average spork? And WHY does it appear not to be designed with the left-handed individual in mind? Seriously guys, because of the placement of the bottle opener feature, I can’t effectively hold it with my left hand. Light My Fire Titanium Spork. The upgraded counterpart of our Best Value pick, the Light My Fire Plastic Spork, the Light My Fire Titanium Spork is not to be underestimated. Its ability as a soup scooping, food stirring, durable camp kitchen utensil was near on par with the Snow Peak Titanium Spork. Why isn’t it our Top Pick, then? It’s 0.1 oz heavier than the Snow Peak and nearly $5 more expensive. That’s a pretty proud price for something that can’t cut through my chicken teriyaki. The design is actually more impressive than the LMF Plastic but not worth the price difference in my opinion. But, if you’re a mega-soup lover and interested in upgrading your camp experience, it’s worth mentioning that the LMF Titanium boasts the best soup spoon design of the six. It mimics the classic Chinese duck spoon shape, and I’d be lying if I said I wouldn’t take it with me in my purse text time I go get pho. If somebody gifted me this spork for Christmas, you wouldn’t hear me complain. Sea to Summit AlphaLight Spork. Ah, the regularly sized sibling of the Best Spork for Ultralighters, the AlphaLight Long Spork. Why didn’t it win any awards? Admittedly again, the stats of the StS spork were on par with a few of the others. It’s 0.1 oz lighter than the StS Long, but I think the multi-functional benefits of the StS Long are worth the extra tenth of an ounce. It’s a decent spork with decent durability, and comes with the same cute carabiner as its sibling. However, I had LOTS of trouble scooping spaghetti with it and I’m too much of a carb lover to make that sacrifice. 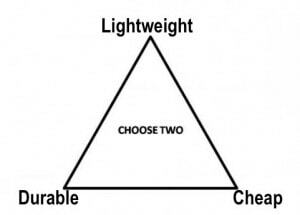 Titanium is the strongest of these three. Plastic is usually the cheapest and lightest. Aluminum offers a happy balance of mid-weight with mid-durability. If you are purchasing a spork for a weekend backpacking trip, you may be willing to sacrifice some durability for ease of carry (polycarbonate). If you are purchasing a spork for your first big car camping trip, weight may not be as important (aluminum/titanium). If you’re looking for something you can throw into a pack or even purse or briefcase during the workweek and forget about, you probably want something indestructible and lightweight (titanium). Is it comfortable to hold in my hand? Does it seem like the prongs may scratch the roof of my mouth? Is the spoon too wide to fit in my mouth or too narrow to actually scoop? How long is it and where will I be storing it? Will it serve any multi-functional purposes if necessary (kitchen serving spoon, bottle opener, spatula, knife)? These are all important questions you will need to ask yourself. As a good rule of thumb, once you think you’ve chosen the right spork, ask the most important question: Would I be willing to replace my entire home utensil set with this spork? If you’re uncertain the answer is yes, you’ll probably hate the thing by day three on the trail. Unless you’re car camping, you should carefully consider the weight of every piece of gear you’re carrying. Plastic sporks are lighter but not as durable. Aluminum and titanium sporks are heavier yet more durable. We’ve listed the weights of all the sporks included in this test in the comparison table at the top of the page so you can easily compare them. A spork is one of the very few pieces of gear where you can splurge without breaking the bank. Prices range anywhere from $1 to $15, so don’t feel bad if you’re paying double digits for a utensil that boasts specs as absurd as aerodynamics. Remember that a spork is still a piece of gear, and it’s replacing both your everyday fork and spoon, and sometimes your camping knife or backpacking knife. Buy something you like, because you’re hopefully going to have it a very long time. The folks over at Expedition Portal and Outdoor Gear Lab have performed similar-ish tests in the past. 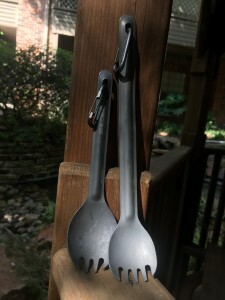 Outdoor Gear Lab concluded that the Snow Peak Titanium Spork was the best overall backpacking spork (obviously). While I didn’t chat up “mouth pleasing textures”, they make some pretty impressive points to consider. I’m pleased to say we had relatable findings. 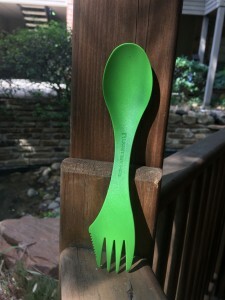 At Expedition Portal, they tested a number of less mainstream sporks that we didn’t include in this test and ended up declaring the Sea to Summit AlphaLight Spork the “Value Winner”. I can’t attest to any of the sporks I didn’t test, but I certainly agree when they wrote, “the more you mess around with a classic design, the more likely you are to screw it up.” Yeah, settle down Eat’n Tool. Thanks to everyone who participated and congratulations to the 7 lucky winners! Hope you all enjoy your snazzy new Snow Peak Titanium Spork. We’ll be doing more giveaways in the near future, though, so like our Facebook page to be notified of the next one! We plan to make them bigger and better from here on out! Shout-out to my partner Tay for taking on the role of ‘Instagram Boyfriend’ for the photography section of this research (per usual). Seriously, look at that champ. Thank him for the beautiful detail and his gift for capturing a bounty of facial expressions.